“Do you want to see The Great Secret?” Halil asked. It was January 2006, and I was sitting in his disheveled bedroom in a Christian Maronite corner of the Bourj Hammound suburb of Beirut. His walls were covered in ripped out pages from skateboarding magazines and UK issues of PC Gamer. He was 16 years old. He started up the desktop computer he had built himself, and opened up the first-person shooter game Counter-Strike. The military-style video game had been updated many times since its initial release in 1999, but this was the same version that had infested my middle school computer lab back then—or some pirated incarnation. Halil connected to a server by manually entering a memorized IP address. Maxwell Neely-Cohen is author of Echo of the Boom, a novel about technology, pop culture and coming of age. His work has previously appeared at The New Inquiry, The Millions and This Recording. He did not join either of the in-game teams, instead becoming a “spectator”. The familiar contours of Dust, the game’s most famous map, lit the screen. Unbound by gravity or physical form, Halil flew to a point overlooking one of the main thoroughfares, where first contact between the two teams often takes place. Dust is a bomb-defusal encounter set in the market center of a Middle Eastern town. I watched as the “terrorists” cautiously moved forward, taking positions to protect the bomb they had set. The clock ticked down in the corner of the monitor. “Who is playing?” I asked him. “Israel and Lebanon” he said. “No no no,” and he smiled, “that wouldn’t be a ‘The Great Secret.’” The team of “counterterrorists” threw a couple grenades and started firing, peering around corners and strafing. “IDF,” Halil pitched his screen to the rushing counterterrorist team, “and Hezbollah,” he tilted in the direction of the virtual AK fire. “This is my ‘Middle East Peace Plan.’” He said the phrase derisively, putting on his best American accent. I didn’t believe him, at first. The teams in the game were made up of the same avatars that always populated it. But Halil then showed me a series of taunting pictures the two teams had posted online. Among the match reports and running commentaries, the Israelis in uniform threw up imitations of American gang signs learned from rap videos, while young men of Hezbollah held real life rifles next to computer monitors, all with their faces blurred or blacked out in Photoshop. My favorite was a succession of shots of real guns, superimposed on computer monitors displaying virtual ones. I was afraid to ask Halil how he had found these participants, especially the Hezbollah “kids,” as he called them, and he refused to say how the game had started. But he disclosed that he and his cousin, an Arab Christian citizen of Israel (they were two of the best Counter-Strike and FPS players in the entire Middle East… according to him), were its unofficial diplomats and referees. The counterterrorists won first. Then again. Halil changed the settings of the spectator mode so we could hear the teams speaking internally. I watched a match hearing moves and bullets and curses in Hebrew. And then in Arabic. The terrorists finally won one. And then another. Seven months later, Hezbollah launched a series of rocket attacks, border raids, and soldier abductions across the Israeli border. Israel responded with a full scale invasion. And the two teams were fighting for real. After the ceasefire, I asked Halil via email if “The Great Secret” game had started back up again. Halil had told me in person, even in 2006 (seven years before the revelations of Edward Snowden), that he felt cagey about digital communication. “It is easy to watch,” he said. So sometimes I wonder if he was lying. I wonder if the game continued. More people are pretending to fight wars than actually fighting them. “The Great Secret” may have just been a teenage thrill, “something cool just to see if I could do it”, instead of a grand statement on the absurd nature of war and peace, or a serious attempt to take groups of people tasked with shooting each other and channel their roles into a simulation where no one actually gets hurt. But Halil was also onto something. He could see that the surging business of video games was beginning to collide and intertwine with the geopolitical realities raging around him. The year after I found out about Halil’s “The Great Secret,” Activision's Call of Duty 4: Modern Warfare was released. 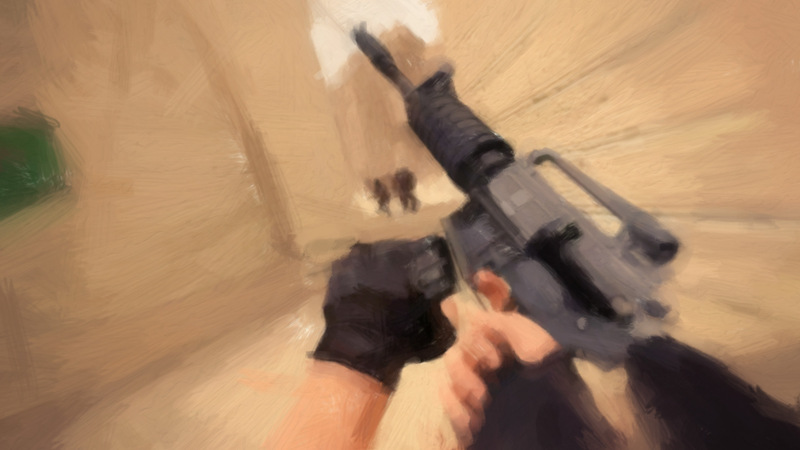 The market trend favored a shift for the shooter genre from World War II settings toward the present day, and the Call of Duty series began alluding to, even directly depicting, present-day American wars in the Middle East. First-person shooters had become the world's most popular genre of video game. The timing was particularly remarkable in the United States. While less than one percent of the American population was serving in our longest-ever foreign military engagements, tens of millions of people were engaged in this mock combat. There are currently 2.2 million US military personnel, and an estimated 2.5 million Americans served in Iraq or Afghanistan over the past 14 years. Games from Activison’s Call of Duty series sold over 18 million copies in the United States over the same period. Electronic Arts sold almost 20 million copies of its Battlefield series. According to the International Institute for Strategic Studies, there are an estimated 20 million active members of armed forces in the world, 26 million reservists, and 7 million paramilitaries. In 2013 Activision announced that over 100 million people had played a game of Call of Duty. And that’s just one single games franchise in one single genre. There are tens of thousands of video games that simulate war and conflict in one way or another. We play an awful lot of video games predicated on shooting something or someone in the face, and this isn’t just a cultural preference, but built into the nature of the medium. This leaves us in an interesting place. More people are pretending to fight wars than actually fighting them. What does this mean? There are many explanations for the military-civilian divide, the lack of a draft, a political system that allows the funding of wars through deficit spending, an endemic civilian culture of disinterest and apathy towards foreign policy decision making. But in addition to these larger constructs, in some small cultural way, video games must have played at least some role in pushing the actual experience of warfighting further from the public mind. The popularity of first-person shooters (which remain unwieldy and unrealistic depictions of actual combat) is the ultimate manifestation of a society where access and knowledge of violent content and events is so high, but actual exposure and experience is so low. Young people, particularly young men, can now fulfil that cultural and psychological obligation towards the experience of organized violence—without actually joining the military. The “go to war to become a man” construction of meaning can now be simulated from the safety of a sofa in front of a flat-screen TV. Video games enjoy a close relationship with the US military, particularly as drivers of simulator and training technologies. In the age of the blockbuster video game, that closeness has shifted, become external. Even with the success of movies like American Sniper and books like Phil Klay’s Redeployment, the most consumed artistic images of the past 14 years of American conflict lie in video games. Much dialogue and writing about video games concerns whether or not games are desensitizing people to war and death. But the further you zoom out, it seems the opposite is occurring. And it is unreal. For all the fretting about video games normalizing violence, or "training children to be killers", video games could hardly be less realistic depictions of the wartime experience they alluding to. Even the most realistic first person shooters—niche games like the Arma series, which sometimes double as military simulators and are often played by veterans—the experience is inherently inaccurate. “They’re never close to realistic,” Marine Elliot Ackerman told me. Ackerman is author of the novel Green On Blue, a veteran of five tours in Iraq and Afghanistan, and a recipient of the Silver Star for his actions in the November 2004 Battle of Fallujah. Ackerman told me the story of how in 2006, while he and his fellow marines deployed to a Marine Expeditionary Unit on the USS Iwo Jima, they repurposed the ship’s internal LAN so they could play marathon games of Halo 3. Between evacuating refugees from the same Israeli-Lebanon war that may have ended Halil’s game of Counterstrike, “we had a massive Halo rivalry, me and my buddy would play one on one to 300 kills.” Eventually the ship’s COMMS officer discovered the misappropriation of the network and shut it down. “I wonder if it fulfills at least some sense of purpose, regardless of what kind of game it is,” Ackerman said. He often talks publicly about the “tremendous high” war can bring in terms of purpose. How being in the military is “like mainlining purpose as if it’s crystal meth.” Games are different. Like having a job or a family or a vocation, though, they enthrall many, particularly young men. Much dialogue and writing about video games concerns whether or not games are desensitizing people to war and death. But the further you zoom out, it seems the opposite is occurring. According to scientist Steven Pinker (as best outlined in his book The Better Angels of Our Nature), human violence, both organized and disorganized, is in a precipitous and continuous decline. Even supposing video games were somehow making us more violent, massive countervailing social, economic, and psychological forces are making us far less violent. It is worth speculating what contribution, if any, video games have made to the global species-level violence decline. There is an oft-reported anecdotal belief that violent games act as a pillow to be punched, a “safe” anger release. But it's more because of the raw number of people (specifically young men who might otherwise be soldiers) spending formative years playing games, and the sheer hours that games take out of life. According to game designer Jane McGonigal, that’s three billion hours a week, every week, that are sucked out of all other pursuits, including organized (and disorganized) violence. The US Army has a video game (America’s Army). Hezbollah has a video game (Special Force). Even ISIS has a video game—two actually, a mod of Grand Theft Auto called Grand Theft Auto: Salil al-Sawarem that may not actually exist as a playable product outside of a YouTube video for social media purposes, and more recently a mod of Arma III originally created to model the fight against ISIS, then hijacked and repurposed to simulate killing Kurdish Peshmerga fighters and chasing down Western hostages. The NSA, CIA, and FBI spent hundreds of thousands of hours in MMOs like WoW and Second Life looking for evidence they were being used for terrorist communications. By all accounts, they found nothing. But if you spend enough time in a Counter-Strike or Insurgency, or even in the bigger budget AAA FPSs, you will occasionally come across a handle like “ISISWINS” or “Baqiya”, with that familiar black flag profile picture to match. And it’s unclear if they are western wannabes, role playing military hobbyists, trolling kids, or the real thing. We know of at least one small-scale instance of the CIA funding the development of video games in an attempt to influence global public opinion of the United States. In his book The Way of the Knife, journalist Mark Mazzetti detailed the saga of U-Turn Media, a Czech-based digital media company that developed mobile media products, including video games, designed to enhance the perception of the US military abroad. U-Turn’s releases included a Call of Duty-type mobile game called Iraqi Hero. While this is the only reported instance of direct involvement with video game development, the CIA has a long history of funding and supporting creative and artistic ventures to enhance global impressions of the US. This history includes everything from mass-media products like the 1954 cartoon adaptation of George Orwell’s Animal Farm, to high culture institutions like The Paris Review and The Iowa Writers’ Workshop. In 2011, I was hired by a private sector risk consultancy to be part of a group investigating and researching “the effect of pop culture on the wars of Bush and Obama.” We analyzed social media streams and pored over movie box office data. One of the more interesting results from that study was just how popular Call of Duty and Battlefield were in Iraq. That regardless of politics, and even with the horrors of real war easily present around them, there was apparently some universal appeal to shooting terrorists in an American uniform. Iraqi teenagers were tumbling and streaming and trash talking about their exploits. But of course, culture does not work along perfect linear lines of propaganda-bred assimilation. It was as true during that project as it has been true throughout my travels: the most popular video game anywhere was never Call of Duty, nor any of its cousins, but entries from the Grand Theft Auto series, which always seem to appear, so often pirated, in the most unlikely and impoverished corners of the world. The American Military in all its technological glory may be extraordinarily successful subject matter for big budget video games (and movies), but it is no match for the sheer cultural power of The American Gangster. Despite the fact that GTA has so often been a punching bag at various points for both Democrats and Republicans, it may be the most successful and influential American cultural export of the 21st Century (this is even more remarkable considering it was [and is] made not by Americans at all, but by two British brothers). GTA holds up a perfect mirror to the real ideals and dreams of the American experience, that we are a popular culture enthralled by money, guns, cars, mobsters, gangsters, thugs, and outlaws, that despite our public exclamations that we “support the troops’, we care more about an antiestablishment drive to the top than we care about our soldiers. Grand Theft Auto is the perfect embodiment of this mythology: massacres, prostitutes and a thumping soundtrack to run under the entire experience. Rockstar’s main offices are in fact exactly 1.2 miles from Ground Zero. Grand Theft Auto III, the first modern 3-D GTA game and the first mega blockbuster, was released exactly one month and eleven days after 9/11. He said that, and together we demoed yet another game that was centered around shooting your opponent in the face where no one actually gets hurt, where flying pieces of metal don’t actually rip flesh and smash organs. And I thought once again of Halil’s “The Great Secret”, and wondered if his game was still going. If in some dark corner of the internet, Israeli soldiers and Hezbollah fighters were still shooting at each other with fake bullets, muttered curses, and laughter. And hiding it from their superiors.